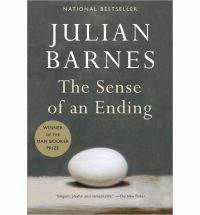 a book chick: "the sense of an ending"
"winner of the man booker prize" is something that catches my eye and my interest ... and such winners are often a bit odd. those British like to go for something a bit different. this story has scant beginnings ... a relationship that didn't go very well. through the narrator we get the sense that she was a bit strange. he tells of his childhood friends and how they kind of fell apart. no great endings. ... until many years pass and old things are brought into a new light. an interesting reflection on relationships, assumptions, and evaluating one's life.